Engineers at the University of Chicago have created a new kind of solar cell that efficiently converts atmospheric carbon dioxide into usable hydrocarbon fuel—and it does so using only sunlight for energy. In a new paper published in Science, engineer Amin Salehi-Khojin and colleagues describe the new system, which can turn CO2 into fuel at a cost that’s comparable to producing gasoline. “Instead of producing energy in an unsustainable one-way route from fossil fuels to greenhouse gas, we can now reverse the process and recycle atmospheric carbon into fuel using sunlight,” noted Salehi-Khojin in a press statement. To make it work, the researchers used a photosynthetic cell, as opposed to a conventional photovoltaic cell. 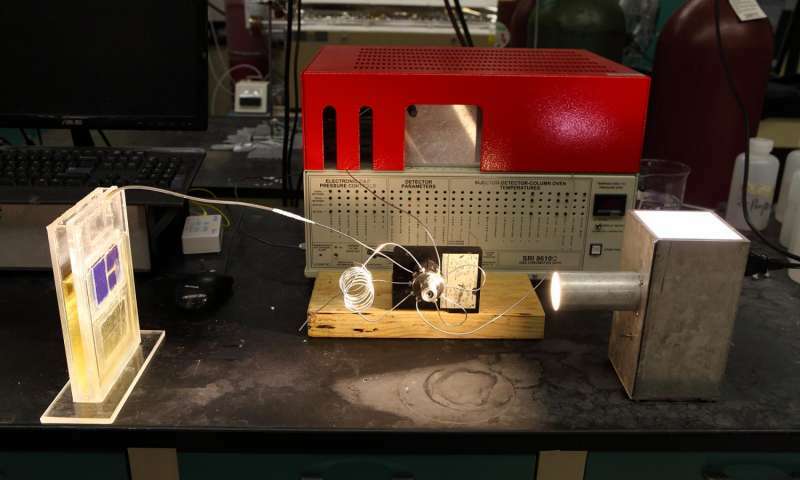 So instead of converting sunlight into electricity and then storing that energy in batteries, the new device converts atmospheric carbon dioxide directly into fuel. In essence, it does the work of plants. But instead of turning fuel into sugar, the “artificial leaf” delivers synthetic gas, or “syngas,” which is a mixture of hydrogen gas and carbon monoxide. This solar-produced gas can be burned directly, or converted into other forms of fuel, like diesel. To make the process efficient, the researchers turned to a family of nano-structured compounds called transition metal dichalcogenides (TMDCs). These compounds served as active catalysts, breaking carbon dioxide’s chemical bonds. Experiments showed that the new catalyst is 1,000 times faster than conventional catalysts, and about 20 times less expensive. In the future, a solar farm could deploy thousands of these“artificial leaves,” which in addition to producing fuel would remove significant amounts of CO2 from the atmosphere. The researchers say the system could also work on smaller scales, and even prove useful on Mars where the atmosphere is mostly carbon dioxide.